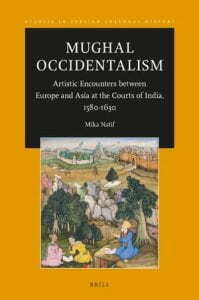 The Sigur Center for Asian Studies, and the Institute for Middle East Studies cordially invite you to a book launch of Mughal Occidentalism and a discussion with the author. Dr. Mika Natif (Ph.D., New York University – Institute of Fine Arts, 2006) is a historian of Medieval art focusing on the intercultural exchanges and global connections that Muslim societies forged with the European sphere in the pre-Modern era. Her primary field of research is Islamic painting, with special interest in Central Asia, Iran, India, and the Mediterranean. She had held teaching positions at Princeton University and at the College of the Holy Cross (MA), and curatorial positions at the Metropolitan Museum of Art, and most recently at the Harvard Art Museums (as Assistant Curator of Islamic and Later Indian Art). She has conducted research in archives, galleries and museums all over Europe, as well as Turkey, Israel, and India.